What ever you said has been been absolutely right, and corporate hospitals were able to generate some profit till now but I only want to stress the point that with the upcoming legislations in various states( Delhi, Taminadu), national medical commission bill, modicare insurance schemes the whole scenario is going to change… The new regulations are going to tilt the balance heavily in favor of smaller establishments. Moat:The only moat they have is quality of care and experienced doctors… With capping of surgical and procedure costs, they are going to loose the moat as there is no differential pricing for various surgeries in New proposed legislation with regards cost incurred for maintaining quality. I am an anaesthetist so I can give you examples in anaesthesia… For a small surgery like laproscopic cholecystectomy the cost of anaesthesia procedure in a small nursing home can be as low as Rs 1000 while the same in a corporate hospital would be Rs 15000/… The smaller nursing can charge Rs 5000/ for anesthesia (400% profit) while the corporate may not be able to charge more than Rs20000/(33% profit)… Of course there would be huge difference in quality of anaesthesia care…The smaller hospital is not giving proper anaesthesia but what we call jugaad anaesthesia…Bigger hospitals may not be able to drop standards for fear of litigations, as they are dealing with different class of people… believe me the most difficult people to handle is those belonging to upper middle class who would come prepared (with Mr Google as there guide), with lots of complaints and questions with regard quality of healthcare but behave poorest of the lot when it comes to payments. Smaller establishments can pick and choose profitable procedures and surgeries while bigger corporates may not be able to do that.Smaller establishments will simply refer sick patients(unprofitable) to tertiary care hospitals, while tertiary hospitals can’t refer anywhere, they must admit and treat all patients. 3.Bigger hospitals need to maintain unprofitable support specialities, while smaller nursing came either outsource them or get services of inexperienced non specialists doctors. There are numerous other reasons which I can go on and on. Just go through all the proposed legislation changes while keeping in mind above reasons and you will get all the answers you need. The next 5 to 10 years are going to be extremely difficult years for corporate hospitals. This mindless consolidation forced upon by the government will take time to settle into a more meaningful consolidation… The government must realize that you cannot settle costs of healthcare merely on popular demands of people. Apollo Hospital is indeed the leader in healthcare companies in India. There is lot of transactions going on in healthcare companies. Although I initially bought Max India only for Health Insurance, I am not able to understand is Healthcare a good long term investment from India perspective? With companies struggling to make profit, investing in best doctors, research and equipment will add to the woes, perception issue is another thing. One thing I am not able to understand is why some big PE firms are on the buyer side. Apart from current low valuation, what other good they see in healthcare companies as long term investments that we are unable to see? Reading all this, I am sad not only as an investor but also as an Indian looking at where the healthcare is heading. I have huge respect for Dr Reddy who created Apollo a lot…as the first man who bought quality heathcare to India. He struggled to create Apollo, government approvals, etc etc. He did that when he saw people in need had to go abroad and only the super rich could do that…he brought world class facilities to middle class and upper middle class in India itself…he created the best for India…I do not think this should be destroyed by policies. I think India needs Apollo, Max and fortis…India needs this quality…I felt bad when came to know that the best stent which is dissolvable is no longer available in india…ultimate losers were patients…middle and upper middle class and poor class people who turn middle will be ultimate losers if more Apollo, max and Fortis do not come up! New Hospitals revenues grew from 2,179 mio in Q1FY18 to 2,665 in Q1FY19, growth of 22%.  5 Managed hospitals with 934 beds.  Of the 8,353 owned hospital beds capacity, 7,093 beds were operational and had an occupancy of 65%. adding 64 stores on a net basis in YTD June 18. In pharmacy, looking at 20% growth for future and at the right time, we will monetize it. Also, looking at a digital strategy to increase customer base through online mode. Reoccuring capex is around 55 crores. 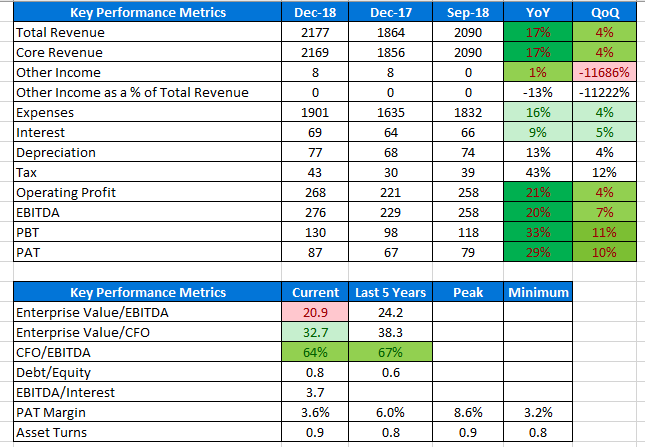 Apollo hospitals is not so much mispriced considering that a) it has a large analyst following, b) fact that RoCEs are low and were low even at their peak, c) an overhang of regulations which is not going to go anytime soon considering the populist governments we have and d) the unique high real estate value and high interest rate scenario in India where cost for doing business is high enough for many heavy real estate dependent businesses to earn good IRRs. For an serious investor on valuepickr devoting time to thoroughly study multiple stocks, there are multiple better avenues to look for. For a newbie wanting some exposure to a quality company in healthcare however, it can be one of the many small bets. 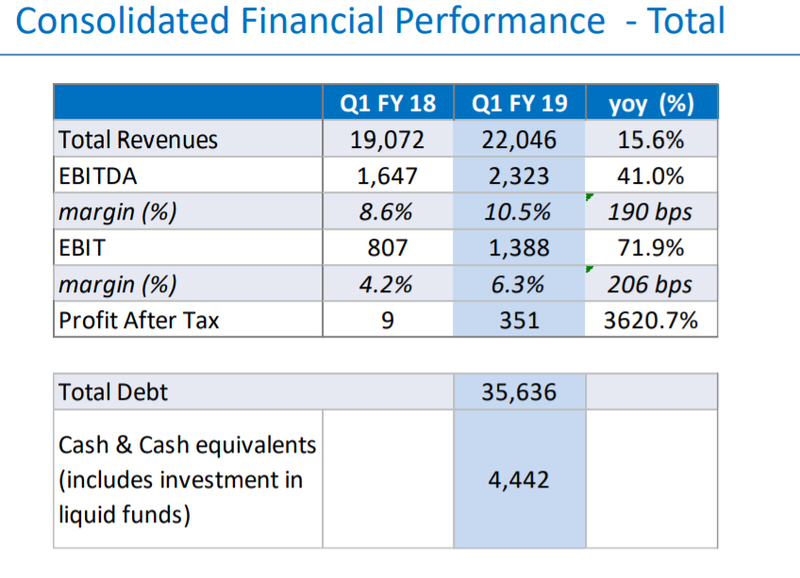 PS - on a separate note, such businesses require a huge capex from time to time for upgradation apart from high growth capex, hence a focus on EBITDA as opposed to PAT or atleast EBIT is also a mistake as depreciation is a very real cash cost. Being a PE investor myself in my previous avatar, I can tell you my reason for the same - most of the PE investments in India is growth investing and they hardly care about cash returns etc., private healthcare in India is having enormous potential to grow and this growth attracts them as such secular growth possibility is not present in many areas. At the same time to grow at high pace you need a lot of fresh equity capital which is what PE guys are able to provide. So its an ideal match. But then private equity in most cases is like playing the game of musical chairs - they are investing in the hope someone else would buy from them at a higher price. I think the reality of this would ultimately be disappointing to many especially in the tertiary healthcare investments which is very long gestation and high capex. Other segments of healthcare including healthcare insurance are arguably much better avenues. 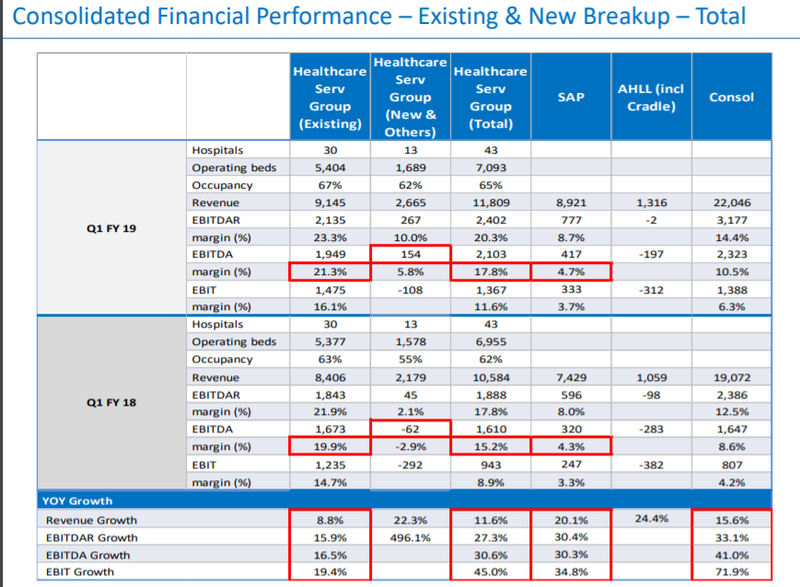 That is also the reason why RJ is putting his capital (3-4k crore) in buying a health insurance company and not a tertiary hospital - its just that the economics of this business is not that great (as exhibited in one of previous boarders presentation where RoCEs were peakish at just low teens inspite of Apollo having market dominance since ages). Note again - I am not saying that apollo is a bad idea, I am just saying there are many better ideas at this valuation of apollo - 3-4x book given its RoCE profile. Thanks for your thoughts! I liked your musical chair concept very much. As far as i remember RJ put money in Fortis which is into tertiary care and diagnostics…am i missing anything as you mention health insurance? Also i completely agree with you on all points. I was attracted to health insurance business so ended up buying max india, realized later that health insurance is still small part of revenues, and problems with its healthcare business were such a drag i never expected it to fall so much. Demerger listing was another valuation mismatch. Overall i havr had a bitter investing experience in healthcare so far. I held Apollo in small quantities but sold it as it did not include in surance business back then. I felt government regulations and related issues also caused long term derating ang negative sentiments on the sector. 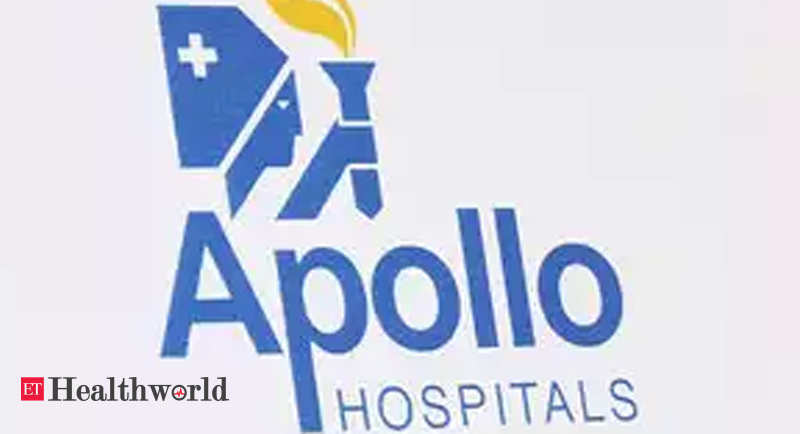 Apollo Pharmacy Ltd (APL) will be a wholly-owned subsidiary of Apollo Medicals Pvt Ltd (AMPL) in which Apollo Hospitals Enterprise Ltd (AHEL) will hav..
Apollo Pharmacy Ltd (APL) will be a wholly-owned subsidiary of Apollo Medicals Pvt Ltd (AMPL) in which Apollo Hospitals Enterprise Ltd (AHEL) will have a 25.5 per cent stake. The other three investors in AMPL, are Jhelum Investment Fund 1 with 19.9 per cent stake, Hemendra Kothari (9.9 per cent) and ENAM Securities Pvt Ltd (44.7 per cent). Have you looked at pharmacy business sale and impact on your valuation assumption . If I am not wrong they have sold 75% stake in pharmacy business for Rs 500 odd crores . Disc : Sold off my small tracking position . @Investor_No_1 Fortis is a special situation with a live open offer at 170 bucks a share. Its a T20 match for RJ for which RoCE doesn’t matter. In any case Fortis investment by RJ has been made mostly around 130 Rs a share which is around 1.25x of BVPS compared to 4x at which Apollo trades. On the other hand, the way I understand it, RJ is putting money into Star Health Insurance for the long term. It is the test match where the RoCE’s matter. As Munger says, in the long run the return to the equity investor closely mirrors the return profile of the business itself. The difference between the two above is what you are missing. RJ is one man army - day trader, short term speculator as well as long term investor. There is a backend and front end (thats how they call it). Backend is the whole logistics, supply chain and procurement. Front end is the retail stores. On an expected 5% stable margins, approx 1% is kept by front end and 4% by backend. 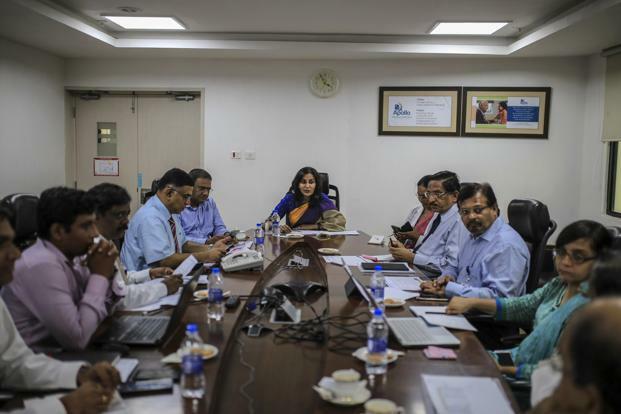 The 75% sell has been done for front end and as per management, 85% of profitability will be retained and after sell of 15% of profitability, they have raised 500 cr approx will which be used either to reduce debt or to expand pharmacy. Also, looks like deal is structured such a way that they can later buy after a certain IRR to current buyers. In terms of valuations, pharmacy overall business was valued around 5000-6000 crs which looks reasonable. Now, we must keep in mind the risks associated in terms of transfer pricing and all which has been existing from long time and we can only trust management. 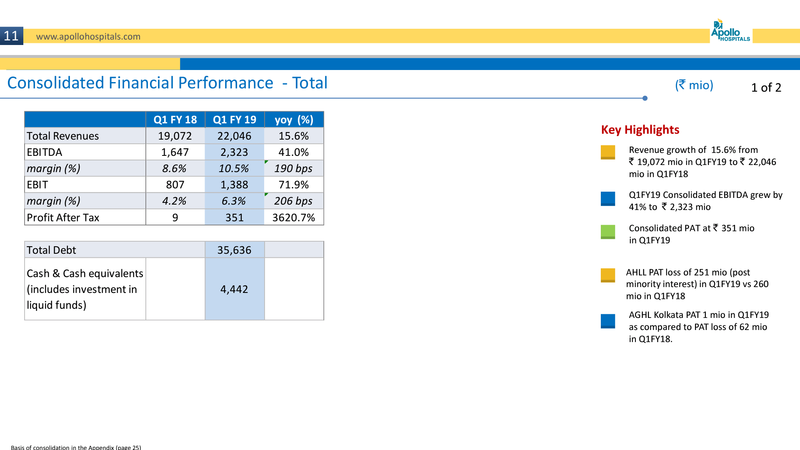 Now coming to results, this is 3rd quarter of turnaround in profitability and company did 29% pat growth with both hospital and pharmacy doing well. Also, i think this is peak of debt and going forward debt reduction should help in further operating leverage playing out. Thanks for clarification . I logged out of stock much early ( @ 1100 odd ) as I was not able to build position as price ran up too fast for my comfort and other opportunities opened up. Any reason for booking profit so early ?? 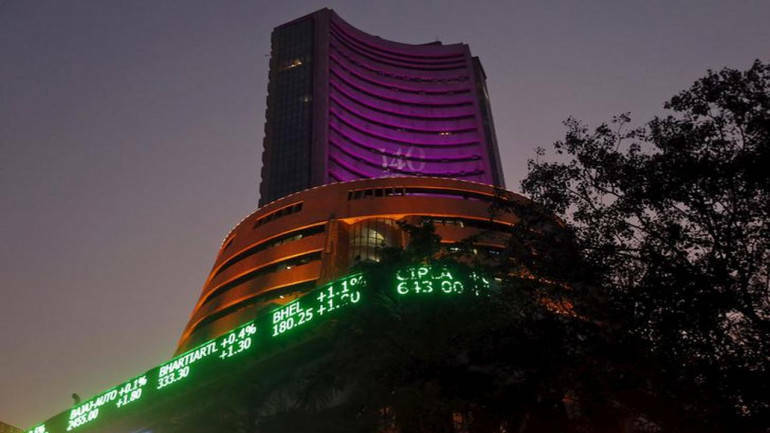 One more company with Corporate Governance Issue… Management pledged shares by 5 percent recently which were largely due to the unwinding of KKR instrument which was closed out in January. Based on the links, it seems they are purchasing they are purchasing heavily from related parties. They themselves are capable for purchasing directly from the respective companies and can earn better margins. Why are they choosing the related party route? Is there is any specific advantage (as we talk about backend operations)? 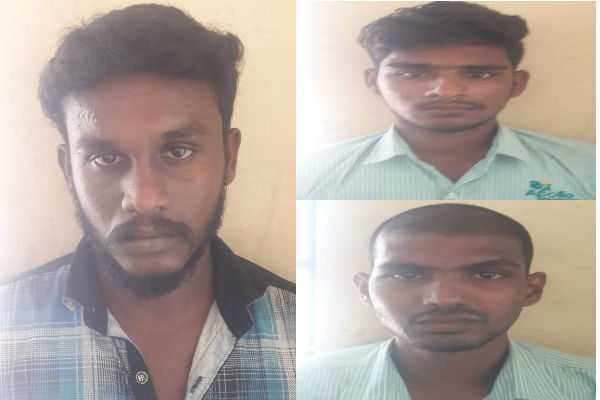 சென்னை: இன்சுலின் மருந்துகளை திருடி விற்பனை செய்த 3 பேர் கைது!